Every year Edublog celebrates the blogs that work to help improve Education. Nominations are open until December 3rd. Once all of the nominations are in, you will be able to vote until December 14th (my son's birthday!). The Award Ceremony is December 15th. 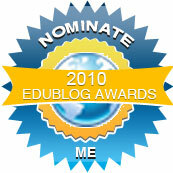 Step 1: Link to the Edublog Awards Homepage, and provide links to the blogs you want to nominate. Any blog or site you like but not your own blogs (sites). Step 2: Send an email in the form on the bottom of the EduBlogAwards page.